Today's "New Band To Burn One To" comes to you from Atlanta, Georgia. Heavily influenced by the rural sludge scene from Savannah and transplanted into metropolitan Atlanta, HALMOS set out to cover the spectrum of sludge metal with their dense, murky riffs, thunderous percussion, and furious vocals. With tempos rarely rising above a crawl, HALMOS focuses its attention on the most essential elements of Stoner Metal - being loud, being aggressive, and looking to steamroll anyone in their way. 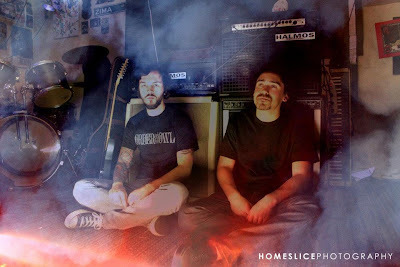 "With a minimalistic approach and belligerent attitude, these two dudes simply known as Halmos rip into a slow and mind-numbing Stoner/Sludge metal blend on their latest EP "Vicious Cycle". The fuzzy warmth of the guitar tone leaves an everlasting buzz long after each song has ended. The band relies mainly on a consistant slow march to ease the listener into their swarm of sound. The vocals bark and command as the simplistic rhythm rumbles inside of your skull. Standout tracks such as "Datura" and "Prophet of Two" show you why less is more. Feel the fuzz!" They have Order of the Owls guitarist as their bassist now! Sounds awesome, saw them on 420. Their ep is free at that bandcamp website! Saw these dudes play with their new bassist - they slay!